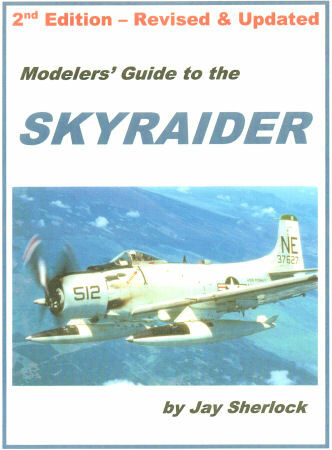 Five years ago, Aero Research published their first modeler's guide covering the A-1 Skyraider. That title provided concise and useful information to the scale modeler on the detail differences between Skyraider versions and variants, but more importantly which kits and aftermarket products would get you to that version. In the five years since that title was published, author Jay Sherlock has compiled additional information and photos as well as cataloging the variety of kits and aftermarket details that have become available since then. Here is the Modelers' Guide to the Skyraider 2nd Edition, 2nd Edition, which features roughly 70% new photos, most of which are now in color, plus full reviews of 19 different Skyraider kits. As before, the title walks you through the various models of the Skyraider (AD-1 - AD-7) plus the special mission variants of these models from early warning radar to electronic warfare. Each topic provides the best kits to start from in each of scales (1/32, 1/48, 1/72, 1/144) and what needs to be modified to create an accurate model of that subject. If you collect reference materials to help you with detailing your models, this series is ideal as it will quickly show you everything from the big bulges to the smallest antennas that are needed to render your kit subject. If you have a Skyraider (or two) in your future, you'll want this title on your bench! I can only hope that they'll get around to Hercules Part Two soon as Part One was also outstanding but left off with the C-130E and its variants.